In the middle of World War II, Nazi military intelligence discovered a seemingly easy way to win the war for Adolf Hitler. The three heads of the Allied forcesFranklin Roosevelt, Winston Churchill, and Josef Stalinwere planning to meet in Tehran in October, 1943. 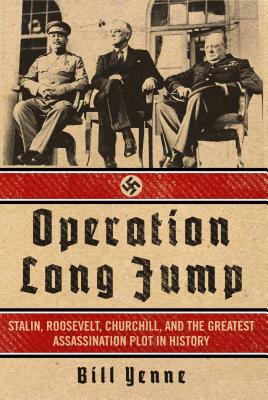 Under Hitler's personal direction, the Nazis launched Operation Long Jump,” an intricate plan to track the Allied leaders in Tehran and assassinate all three men at the same time. I suppose it would make a pretty good haul if they could get all three of us,” Roosevelt later said. Historian Bill Yenne retells the incredible, globe-spanning story of the most ambitious assassination plot ever thwarted in Operation Long Jump. Bill Yenne is the author of more than two dozen books on military, aviation, and historical topics, including Hap Arnold, The White Rose of Stalingrad, and Alexander the Great. WWII History Magazine wrote that his book B-17 at War "is a source of unending pleasure to the Flying Fortress fan," and Air Force Magazine wrote that his primer on strategic air power "deserves a place on any airman's bookshelf." Yenne is a member of the American Aviation Historical Society.